Websites have one-sided, unfair contracts. Apps access phone features that let them spy on you. You're not reading the fine print. But you should. When Android phones don't bring a built-in flashlight, many people turn to the "Brightest Flashlight Free" app, which can turn on and off the camera's flash. More than 50 million people have downloaded this app -- without realizing that it secretly spied on them. The terms of service said the app would periodically collect information. But it wasn't clear the app tracked a user's every move and sent that information to third-party advertisers. Worst of all, "accepting" the terms of service was a ruse. The app started gathering location data before a person even gave the app permission to work. It was so bad that the FTC sued the company and its owner in 2013. 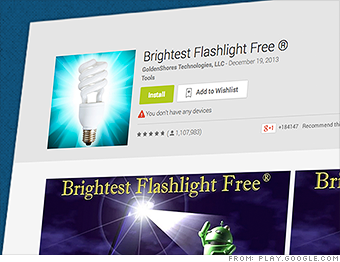 Goldenshores Technologies and Erik Geidl settled the charges with the FTC. They agreed to delete any personal data they already had and, going forward, fully inform customers about the surveillance and wait for permission to start.